I started to read recipe books the day I got married. I have to make sure that I cook our meals every day and that it is something simple and new every day. Well, I guess I tried so hard that sometimes, during my first attempt, I always fail and that's okay, because based on the mistakes I did, it is where I learned and the next time I cook or bake something from a recipe I perfectly made it. Cooking is much more fun when you have the right cooking utensils. We have a 7 year old cooking utensils and they were the ones that comes with the set of pots and pans my darling bought 7 years ago too. I am not truly picky, but when a material is made out of a plastic, some kind of plastic that isn't sturdy at all, they normally won't last. And even if they do? It won't be as good as a brand new one. And since ours is already showing a worn, I need to acquire a new set. 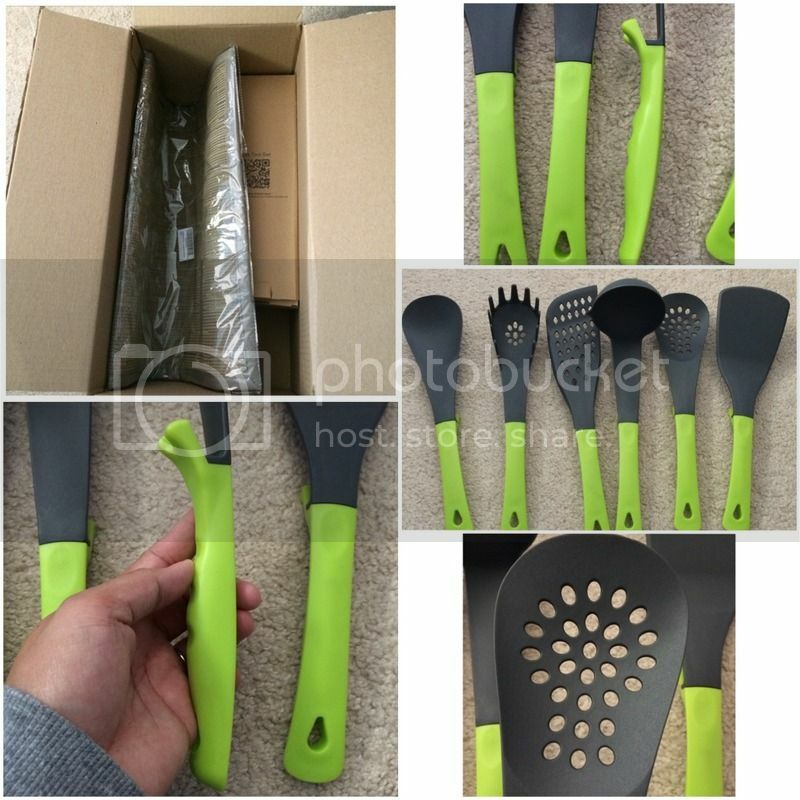 Glad I have the opportunity to receive a set of cooking utensils to test. I purchase the item online through the promotional code that was given to me. My transaction went smoothly and I placed my order without any problems. The product arrived in the mail through the UPS. I see no signs of damage to the items that I was able to test them right away. Of course I have to sanitize them and I washed the cooking utensils immediately. I hand washed it and it was easy to clean and dry's fast too. They look heavy, but I was wrong, each utensil was very light weight. I like the color and the handle. It is not slippery and the rubber that is being use helps out so I won't drop it. I like the back portion too, I used it to put the cooking utensils itself without touching the sink or the kitchen counter. Also, if you have a pot you can hang the cooking utensils in the side of the pot. I like it because the product seems to be sturdy. I only been using it for a week now and so far I never have a single problem at all. I have to say for the Price of $39.99 and now on Sale for only $21.99, You Save: $18.00 (45%) it is a very great deal. Can also be a great gift for the upcoming Holidays. You can purchase it here. I love a complete set of cooking utensils because I love cooking! These are cute looking ones too! The color will go great together with my utensils here in my kitchen. What a great set. I LOVED the color of this utensils you got Mommy N. Those will make cooking easy.